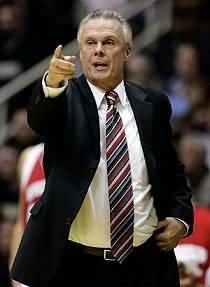 First see Bo Ryan's Wisconsin Swing Offense. Below are a number of plays used by Coach Ryan with his swing offense. All of these plays start with the swing offense basic set and player numbering (diagram below). 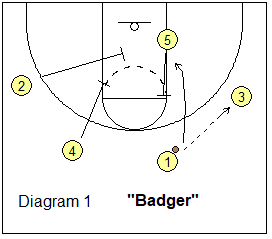 Badger is a good play if your point guard is a good shooter. It involves two double staggered down-screens. O1 passes to O3 on the right wing (diagram 1). 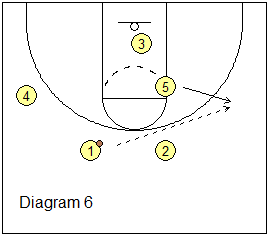 O5 sets the UCLA up-screen and O1 cuts around the screen to the basket. After the UCLA screen, O5 steps out to the arc. Next, O2 and O4 set a double staggered down-screen for O1 (diagram 2). O3 passes back to O5. 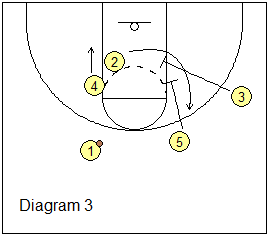 O5 then passes to O1 coming around the double screen for a possible open 3-point shot. If O1 is not open for the shot, we now look for our other good shooter O2. O3 and O5 set a double staggered down-screen for O2 (diagram 3). O2 cuts hard around the double screen (diagram 4) looking for the pass from O1 and the 3-point shot. Diagrams 5 and 6 show additional options. O3 reads what the defender is doing and may be able to quick slip the screen for the pass from O1. O5 could either shape up for a pass at the high post, or after O2 and the defender have cut past his screen, could pop out to the arc for a pass from O1 and a 3-point shot. Coach Ryan stresses that O5 must wait for the action to pass him before popping outside, because if he bumps the defender (chasing O2) on the pop-out, he could get an illegal screen call. If nothing is open, default back into running the basic swing offense pattern. Play-1 is a pick and roll play for O1. Diagram P1A shows O3 cutting baseline and clearing to the opposite corner. 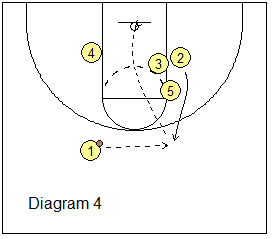 O5 back-screens for O1 to run the pick and roll play. If O1 can't turn the corner with the dribble, he dribbles out to the wing. Meanwhile, O4 screens for O2, and O2 moves up top, filling O1's original spot. O4 screens for O3 and O3 fills the left guard spot, while O4 fills the left wing spot (diagram P1B). From here, we run the basic Swing motion with O2 making the UCLA cut. This is essentially the same as play-1, except that O2 runs the pick and roll with O5. See diagram P2. O3 cuts through to the opposite corner. O4 screens for O2 and O2 comes to the top. O1 dribbles toward O2 and O2 takes a hand-off from O1. O2 then continues the dribble and runs the pick and roll with O5 once again as the screener. If the defense stops the pick and roll, O2 dribbles to the wing, O1 moves back to the top right guard spot, O3 would be at the left guard spot, and O4 at the left wing, and then we run the Swing offense from there. Play-3 uses a back-screen to start the offense. 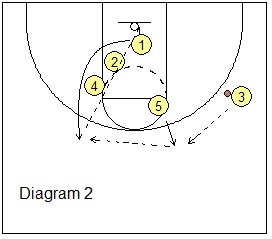 O5 moves up and back-screens for O4, and O4 basket-cuts inside (diagram P3A), and could receive a pass from O1 for a lay-up. O5 pops out on top and gets the pass from O1 (diagram P3B). O4 screens for O3, and O3 makes the flex-cut. O5 could pass to O3. O4, after screening, opens up to the ball and will often be open for a pass and shot. Play-4 starts with O2 shallow-cutting around O4's screen (diagram P4A), and O2 receives the pass at the left guard spot. O5 slides to the ball-side lane and becomes a screener. After screening for O2, O4 cuts under O5's screen and could get the pass from O2 (diagram P4B). After screening, O5 shapes up to the ball and is often open for the quick pass from O2 for a shot inside. Play-5 tries to isolate O5 in the post. Use this if you feel your post player is better than his defender, or if the post defender is in foul-trouble and has to be careful defending. See diagram P5. O1 passes to O4, and O1 fades a little toward the wing. O3 cuts around O5's screen and clears to the opposite corner. O4 passes back to O1, and after screening, O5 fakes a cut across the lane and quickly stops, drop-steps and seals the defender, and receives the pass from O1, and makes a post move for a shot. Play-6 starts with both O4 and O5 high, and O2 and O3 low in the corners (diagram P6A). This play could be run to either side. Here, O1 dribbles around O5's screen to the right wing, as O4 moves inside up the lane line, and O3 moves into the ball-side low post. O5 steps out and gets the pass from O1 (diagram P6B). Meanwhile, O4 down-screens for O2. O2 cuts hard up to the top for the pass from O5, and the 3-point shot. Optionally, if the X2 defender is chasing O2 around the screen, instead of getting the pass at the 3-point arc, O2 could curl around O4, and cut inside to the elbow and get the pass there for a short jump-shot (diagram P6C). Play-7 starts with the usual Swing look with O1 passing to O3 (diagram P7A). But now O5 (who is well-defended inside) cuts out to the corner and receives the pass from O3. 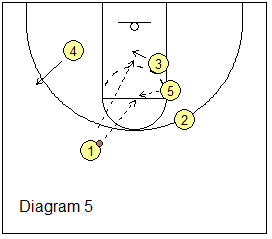 O3 basket-cuts through and could get a quick pass back from O5 for a lay-up. O3 continues the cut and then back-screens for O2 (diagram P7B). O2 makes the flex-cut to the ball-side block and could get the pass from O5. If not, O5 dribbles up to the wing and passes to O1. Meanwhile, O4 down-screens for O3. O3 cuts hard to the top for the pass from O1 and the 3-point shot (diagram P7C). Again, after screening, O4 could flash-cut into the lane for a quick pass from O1 and the inside jump-shot.